In 2009, TIMA brought Sue Clifford, founder and director of the Common Ground organization in England, to Eastport, Maine and surrounding communities to present a series of workshops about her organization’s work on developing community based parish maps. Building on the success of these workshops, TIMA began an initiative to undertake the development of a combined Parish Map and Bird’s Eye View for Eastport, Maine. Click here to view the TIMA produced Parish Map poster detailing Sue Clifford’s 2009 visit. Six years ago, TIMA commissioned artist, architect and architectural historian, Kirsten Sparenborg Brinton (now of Tacoma, Washington), to create a new contemporary bird’s eye view and parish map of Eastport. In 2012, she spent time in Rome to study the history of bird’s eye view maps. TIMA had earlier commissioned Sparenborg Brinton to hand draw a large scale streetscape drawing of Eastport’s 30 building downtown National Register Historic District that was completed in 2011. Bird’s Eye View aerial maps were very popular in the 19th century with most larger towns and cities having one. Eastport had one produced by the J. J. Stoner Company of Wisconsin in 1879. Now, more than a century later, Sparenborg Brinton has painstakingly hand drawn each building, street, shoreline and wharf of today’s Eastport that make up the map. For the Eastport map, she has relied on aerial photographs supplied by TIMA, Christopher Boyer of Kestrel Aerial Services, and extensive use of Google Street View. 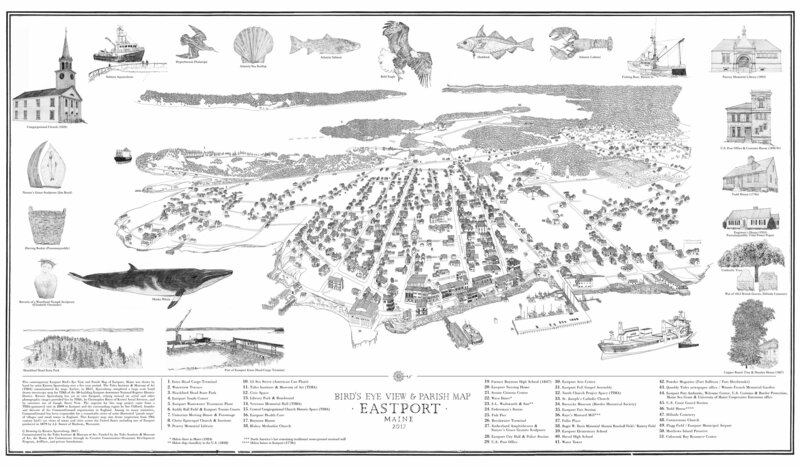 Sparenborg Brinton describes her process of developing the Eastport bird’s eye view map in her blog. Not all of Eastport is included in the new map, only about two-thirds. The bird’s eye view and parish map has now been completed and can be seen below. Full size versions of the map are being digitally produced for display in public locations. Smaller size versions of the map have been produced for sale, just like the 1879 map was, as a detailed recorded view of a place in time. Copies of the 24″ x 14″ map are $35 each and can be purchased at TIMA’s main building or online: Eastport Bird’s Eye View & Parish Map.